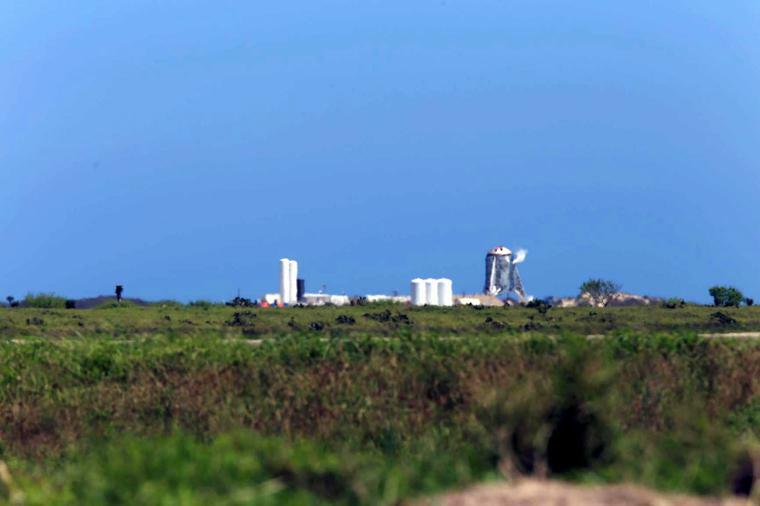 Strong winds have limited what can be heard during today’s testing of the SpaceX Starship. Just before noon, sounds started coming from the SpaceX South Texas Ground Control Station at Boca Chica Beach. From a distance, crews could be seen watering down the launch site. At one point a tanker truck was turned away from the hard checkpoint set up a distance from the testing location. Wednesday morning, the soft checkpoint was moved to just west of the U.S. Border Patrol checkpoint on Highway 4, according to someone who just got in before the area was closed. A number of deputies were moved from the beach access area to the hard checkpoint. After a few hours of no sounds coming from the test site, white smoke could be seen around 1 p.m. and then soon afterwards what can be described as 30 second long sucking sounds emerged from the hopper. The smoke has been pouring out of the valve on the upper part of the rocket, similar to Monday’s testing. The noise has continued all afternoon. Also, all the work materials under the hopper appear to be removed this morning.